And here I thought PETG would be easy to print. Well, I was wrong. In preparation for Including the Kitchen Sink! I'm undertaking a few upgrades to the Plastic Pusher (A heavily modified Monoprice Maker Select v2.1) The first of which has been to construct a dry box to store the rolls of PETG in a dehumidified sorta way, lest they taste the breezes of Boston and undergo the dreaded hydrolysis and loose its former strength. Determined to make it work, I started tweaking setting and looking into alternative mods that could be applied to make it work better. To that end, tweaking the print speed to 60% of its original speed and adding an extrusion multiplier of 115% seems to have done the trick, but only for select things, and without a part cooling fan, which will doom some finer details and severely slow downs the output of the printer. 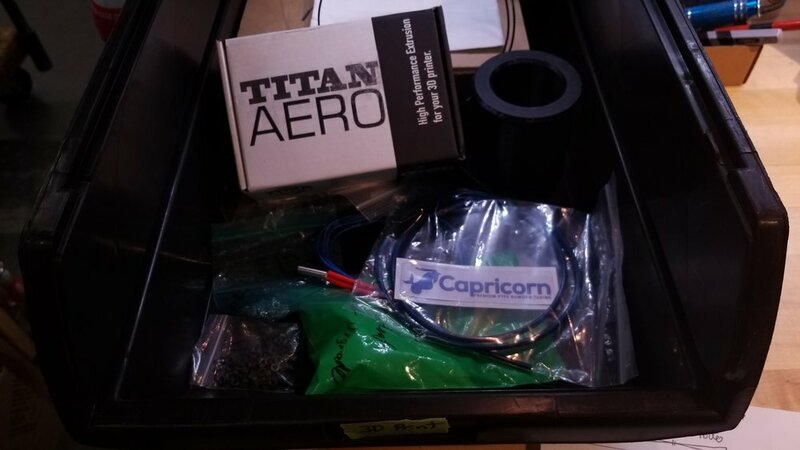 This seems like an awesome material, and besides the issues that I'm initially having looks to be a great next step in making my printer ready to produce the mechanical components required in Including the Kitchen Sink! An E3D Titan Aero and some specialized bowden tubing, supposedly made to be able to print damn near any thermoplastic I throw at it. Carbon Fiber Plastics, Nylon, Flexibles, oh my!